FightVG: Quick Pic: Mega Man announced for Super Smash Bros.
Quick Pic: Mega Man announced for Super Smash Bros.
Nintendo's E3 2013 Direct conference is over. 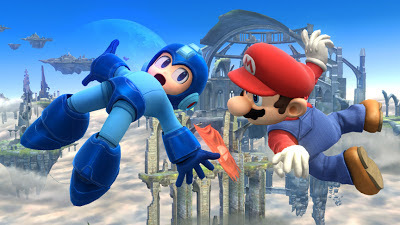 The big reveal was Capcom's Mega Man would be making his way to the upcoming Super Smash Bros. title. Everyone's favorite Blue Bomber is coming to the Wii U and 3DS. At Nintendo's E3 2013 Direct conference, a trailer for the upcoming Super Smash Bros. game was showcased. Mega Man is making his long awaited return to the fighting game genre.